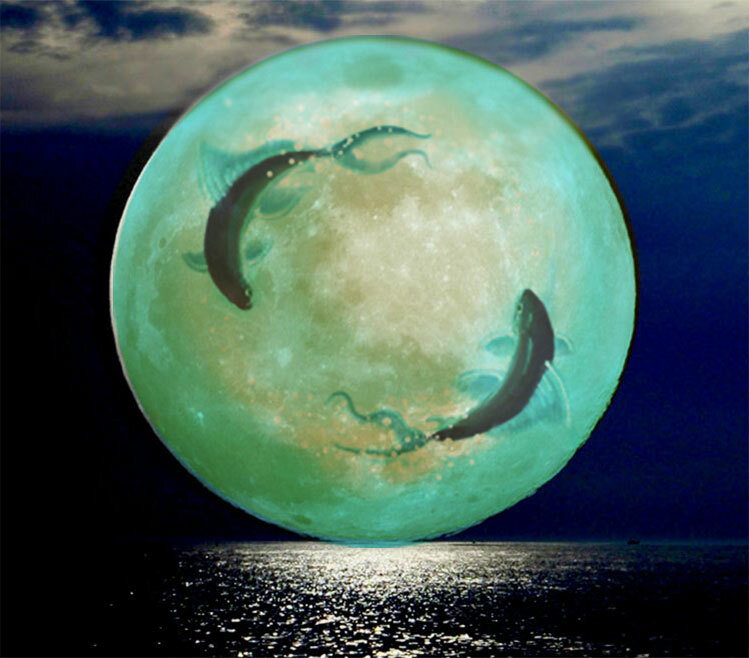 The Full Moon Eclipse arrives at 24 degrees of Pisces on Friday, September 16 at 3:05 PM EDT. At this time, a pinnacle moment of powerful and immense emotional depth is upon us in which we are imbued with heightened awareness and the ability to embrace irrevocable change. During a full moon cycle and most especially during a lunar eclipse, our psyches are primed for bringing into consciousness that which was hidden from view. We discover hard truths. This recognition paves the road to our expansion and evolution. Pisces the Fish is beckoning us to dive deeply within our emotional life. What appears as pain, complexity and turbulence is serving to awaken us. This is a moon of deep and intricate emotional healing. Feelings abound. In order to heal, we must feel. While intense emotion can seem overwhelming, it is paramount to find the time and space in which to feel and express our emotions, for this Moon is clearing out ancient emotional imagery which has only served to block us on our path to happiness and fulfillment. We emerge from a realm of fear to a place of faith. A new emotional milieu is on the horizon. The self is comprised of multiple dimensions. No sign is better able to speak to this than Pisces, the quintessential sign of emotion, cosmic consciousness, multi-dimensional reality and spiritual expansion. Pisces is a mutable water sign, ruled by Neptune. Oceanic in nature, Pisces encourages and inspires us to dive deeply into the sea of emotion.The qualities of compassion, empathy, sympathy, sensitivity, creativity and spirituality resonate for us. We are endowed with receptivity and the ability to see where grace shows up in our lives, where we enact grace upon others and where the magical threads of humanity weave an intricate pattern of perfection. Wherever Pisces resides in your chart is where you are especially otherworldly. There is exquisite sensitivity and tenderness. It is an area of boundlessness. There may be uncertainty and confusion within this realm, for it is not a worldly realm. It is an area in which self-compassion is essential. This exact spot speaks to the nature and quality of our spiritual life. The full moon eclipse will illuminate this sector. What area of your life is deserving of compassion? Are you treating yourself with kindness and sensitivity? Are you extending these qualities to others? Can you forgive yourself? Can you forgive another? Do you need to express your feelings to yourself? Do you need to express your feelings to another? What is your relationship to God, The Divine, Source, Higher Power? Pisces’ realm is quite mystical. Boundaries of time and space disappear as we commune with cosmic consciousness. When Pisces is about, we are called upon to dialogue with The Divine. Our hearts are more fully open at this time. We recognize our own vulnerability as well as the vulnerability of others. In essence, we resonate with the human condition while embracing ourselves as spiritual beings. As Pisces has a proclivity for carrying the weight of the world’s sufferings, we are imbued with heightened sensitivity. The woes of the collective are most readily heard and felt at this juncture. Most challenging for Pisces is walking with an open heart, while not allowing oneself to become inundated with the sorrows of the planet. Pisces reminds us that genuine compassion for self is paramount to walking compassionately in the world. By cultivating compassion for self and others we contribute peace and healing to humanity at large. We are ready to heal. We are ready to evolve. It is time to lighten the load. Pisces Full Moon Blessings Upon You. …we are luminous beings. We are perceivers. We are an awareness; we are not objects; we have no solidity. We are boundless. Thank you for the information Donna. You are welcome, Patty. I wish you every blessing through this transformation. aaaaaahhhh….from a blue rise of galaxy water, Lapis blue, indigo… Boundless indeed!